The feeling of an indissoluble bond is there." "No one in the whole world has a husband like mine If I am held in high esteem in the world, it is because of my husband." Bapu's discrimination and Ba's determination "You have grown very old indeed !" How Bapu nursed Ba ! Bapu's Satyagraha in the house ! Ba, the mother of the poor Ba : "When we are with him, then that makes all the differences." Ba : "Well, you know now, what Bapu is like !" Ba : "You! Afraid of me?" Bapu : "Ba's courage is endless." Ba : "But why are you so nervous?" Bapu : Well, that is just like Ba !" Bapu : "For you also, Ba, am I a Mahatma?" Bapu : "Ba has simply to be obeyed!" "She has even brought about a quarrel between us !" Ba's attitude towards the Brahmans Bapu : "Tell the beads of your Grand-ma's name, Kahana !" Ba's fondness for games Ba : "We shall all go together." Ba's Sympathetic Nature "No good and wise persons in Sevagram except..."
Ba : "Everyday Bapu is up to some mischief !" Ba : "Bapu deserves it !" Ba's use of English Ba leans how to write English at the age of sixty ! Ba's child-like simplicity Ba, innocent as a child ! 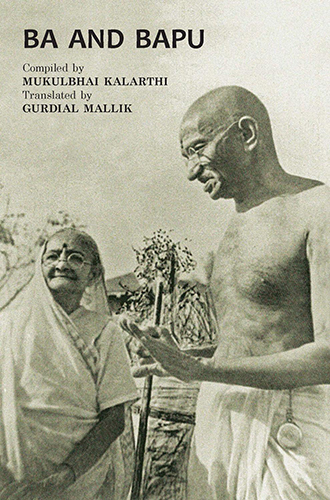 Ba, ever curious as a child Bapu's mother ! "Did you see the result?" Bapu : "Well, Ba was unique." Bapu : "Ba is always sitting here." Bapu : "I know Ba better." 74-year-old student Ba ! How could Ba ever bear it ! Bapu's faith in Ba Bapu : "Ba, I do not look upon you as a doll of clay." Ba : "I want to die in your lap, Bapu." Ba : "If I am separated after all these years." Ba's observance of fasts and festivals Bapu : "I cannot keep Ba away from me." God's name, the only Panacea Ba : "Rather rejoice at my going away." "When Ba calls me" Who was more fortunate?